SIPs best-known example is Earthbox. As of year 2014, the most cost effective planter is available at Home Depot and Lowe's for $30. 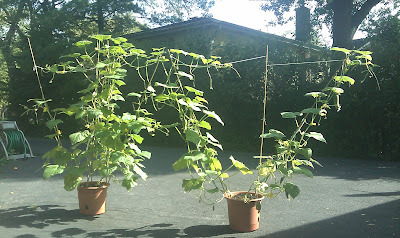 Cucumbers after 6 weeks in SIP. Note the tepee (left) and another type of bamboo stick support with trellis (right). Cucumbers, peppers, lettuce and Swiss chard in SIP. How to make a potting soil for a 5-gallon SIP bucket? 1. Miracle Grow potting soil works well. You will need one cubic foot potting mix/soil (not garden soil or top soil). You can add an organic fertilizer (1.5 to 2 cups per bucket). For tomatoes only, you add hydrated lime (one cup per bucket mixed into top 6 inches of soil). 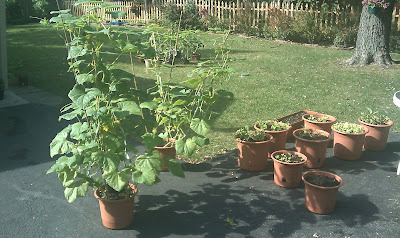 Which plastics are safe as plant containers to grow vegetables? Which ones should not be used? 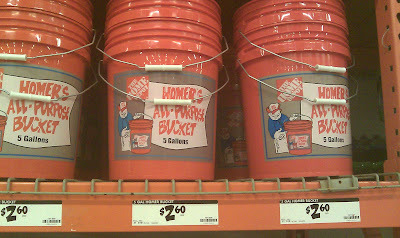 The Home Depot buckets ARE not food grade, and toxins are used on them during production that make them unsafe to use for growing food. Lowe's sells FOOD GRADE containers, or you can get free ones from food stores, delis, etc.